Kick off summer with a musical experience of a lifetime. 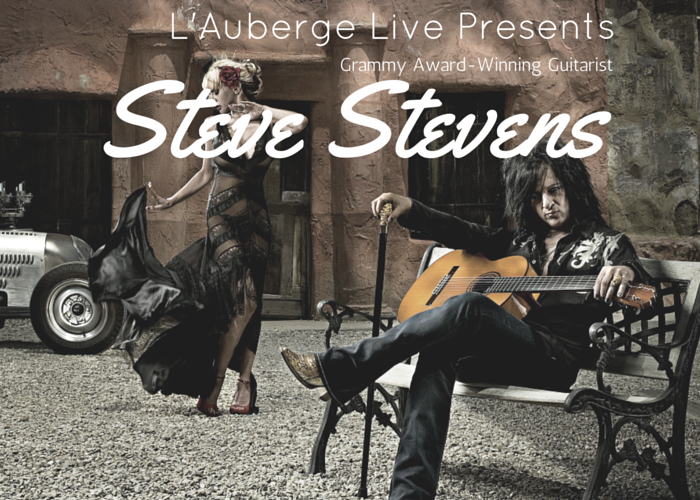 Enjoy the music of Grammy award-winning guitarist, songwriter and composer Steve Stevens during an exclusive creek side performance at the L’Auberge de Sedona on Thursday, May 26. Steven’s passion for Flamenco guitar, as presented in his Solo album ‘Flamenco A GoGo’ will take you on a musical journey in one of the most beautiful settings in Arizona. Joining him are notable artists Ben Woods on guitar, Mike Bennett on percussion and Flamenco dancer Arleen Hurtado. A private, catered performance from Grammy Award-winning guitarist, Steve Stevens inside the Creekhouse. Enjoy hors d’oeuvres and cocktails with a private bartender and server as you relax and take in this intimate experience. For more information or to book the Steve Stevens package, please call: (888) 639 8259. To purchase passes for General Admission, Second Row Table, VIP Front Row Table or Post-Show Meet & Greet, please click here. L’Auberge de Sedona is located at 301 Little Ln, Sedona, AZ 86336.